30.5" x 22.5", framed size is 39" x 31"
Some time in the late 90's I received a call from the owner of Sailor Valentine gallery in Nantucket. A curator from the Smithsonian was planning a large traveling exhibit in celebration of Martin Luther King's life. 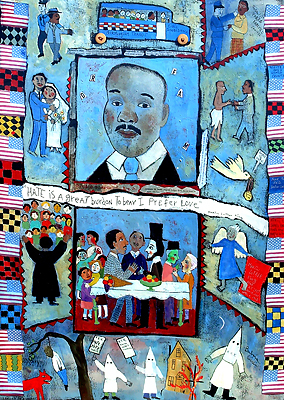 They were inquiring if Carolyn Walsh, the gallery owner, knew of any of her artists who would be willing to paint a picture about Martin Luther King to be considered for this major exhibition. I was called and I was eager to accept the challenge. I painted two paintings and both were accepted - I was thrilled. I received a letter of acceptance and was told the exhibit was still a year away. A book, "In the Spirit of Martin", was published by Tinwood Books to travel with the exhibit and both of my paintings were included. A few years ago I exhibited one of the paintings at Folkfest in Georgia and it was purchased for a school library. At this time in my life I feel I should sell the piece so I will know where it goes and so more people will be able to see one of my last large patchwork pieces. The vignettes show Martin being arrested, the Rosa Park bus, his marriage to Corretta, his image with the letter spelling dream, his meeting with Mahatma Ghandi, the Noble Peace Prize, leading a sermon with his congregation, inner faith meeting, the angel holds a banner with his birth and death info inscribed on it, the very bottom shows the cruel realities of racism and the KKK. The art floats on Linen. The frame is a burnished silver. All materials are archival and Museum quality.